Make sure you absorb the nutrient goodness flaxseed has to offer by learning which type to buy and how to store it! The tiny flaxseed hails from ancient Egyptian times. And although it dates back thousands of years as a mainstay source of nutrition, it's become a common sight in cereals, smoothies, and cupboards in the past few years. And for good reason! 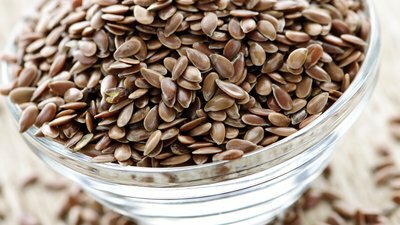 The flaxseed packs an abundance of health benefits that you'd be foolish to pass on. At this point, the decision isn't simply whether or not you should eat them—you should! Rather, the decision is how to best eat them to ensure you're reaping the bounty of benefits they have to offer. Here's what you need to know! Flaxseed can be purchased in it's natural whole-seed form or as a ground option (also called flax meal). Whole seeds have a shiny coat on the outside that can keep their nutritional goodness sealed inside all the way through your digestive system. Grinding them up into a powder will free up the nutrients and allow your body to absorb them. A coffee or spice grinder will do the trick, so you can put it to use right away. When purchasing flax, be sure to opt for brands using opaque bags, such as Bob's Red Mill, to prevent light from damaging the delicate oils. Even better, transfer them from the bag to an opaque, airtight container, where whole flaxseeds will easily keep for a year or more. Once ground, the clock is ticking until flax can turn rancid—usually a few weeks. To prolong shelf life for up to six months, store flax meal in the freezer. But consider this a vote for buying them whole and grinding them right before using them. Flaxseed oil can also go bad in a matter of weeks or months, depending on how you store it. The ideal situation is in the fridge in an opaque bottle. The bottle will almost always have an expiration date of about six months, which should be respected. Flaxseed oil is definitely a healthy source of omega-3s, but what it's not is cooking oil. Only use it in cold preparations or added to cold drinks. Heating it or attempting to cook with it will eliminate all of its benefits. Which Color of Flaxseed Is Best? As with most foods, there are several varieties available. On store shelves, you may see both golden and brown flaxseed. There is no data demonstrating any major nutritional differences between the two, so don't sweat the choice either way. Given that they have little flavor and are a fine powder when ground, flax can be unobtrusively added to plenty of dishes. Here are some easy ways to get it done. Stir a couple tablespoons ground flax into your morning oatmeal. Blend a tablespoon or two into post-training protein shakes and smoothies. Use flaxseed oil when making salad dressings and sauces like pesto. Flaxseed oil doesn't hold up well to heat, so keep it out of the skillet. Use ground flaxseed instead of breadcrumbs in recipe like meatloaf. Incorporate flax powder into homemade energy bars and balls. Swap out about one-quarter of the flour in pancake and waffle batter with ground flax. Stir together 1 tablespoon of ground flax with 3 tablespoons water, and use this as a replacement for an egg in baked goods like muffins.